Drat that avid blog reader, Kathy Hall! She asked me the living abroad question of all questions. How do avowed foodies living in a country with such a great cooking tradition satisfy their palate’s need for diversity. Didn’t I miss Jamaican food, Thai food, French Food, Mexican Food, Ethiopian Food, SUSHI!! 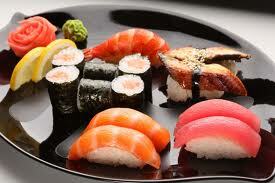 Images of sushi flutter through my mind. Damn, now all I think about is Sakura Sushi in Hillsborough NJ – home of the best Sushi in the tri-state area – I know it’s the best because I sample sushi everywhere. Time to be proactive and stop just dreaming about Rainbow Caviar Roll, yellowtail pieces, raw fresh scallops, spicy tuna… I googled Sushi in Campania. Whoa – there are a bunch of sushi joints in Naples. Rats – driving in and out of Naples is a harrowing experience. What to do – oh, down on the bottom of the list was a place called Sosushi in Avellino. I googled it – a franchise with 30 restaurants through out Italy. Mc Donald’s of sushi? H’mmm – stop procrastinating. Avellino – we have never been to Avellino and it’s only about 45 minutes away. Let’s go! And with that the Sushi Quest began. I am speechless. Do the Italians really like such sweet food?? When we tasted the maki, we were speechless too. It could just be this franchise’s take on the Italian palate. Pals have said the sushi in Naples doesn’t taste sweet.